We provide a variety of surgical services ranging from minor wound repair to more involved procedures such as abdominal exploratory surgery, and spay and neuter. Our surgical suite is fully equipped with state of the art surgical tools, anesthetic monitors, warming beds, I.V. fluid pumps, and gas anesthetic machines. Our goal is to provide the safest anesthetic experience for each and every patient. Surgical patients’ vitals (including heart rate, ECG, blood pressure, temperature, respiratory rate, oxygenation, end tidal CO2, etc.) 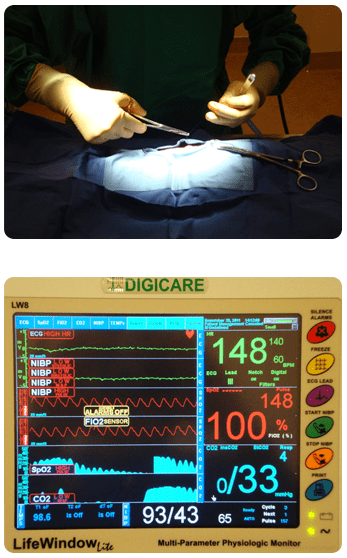 are closely monitored using both anesthetic monitoring equipment and by a dedicated team member. Because each patient is unique, individual anesthetic protocols are determined by physical exam findings, age, surgical procedure, and any underlying illness. Running pre-anesthetic lab work helps to reduce the risk of anesthesia. Checking organ function and performing a complete blood count will give the doctor information regarding your cat’s health and help to determine the appropriate anesthetic protocol. After surgery, patients are closely monitored to provide a smooth and healthy recovery. Appropriate pain management increases your cat’s comfort level, decreases fear, anxiety, and stress, and results in quicker recovery from surgery or injury. Every patient undergoing a surgical procedure is assessed individually and receives the proper level of pain control.